This pistol-shotgun combo is probably the worst gun in the game. In most shooter games, there’s always at least one gun that’s just really, really bad. Well, in Apex Legends, that gun is the Mozambique. The Mozambique is essentially a pistol and shotgun fused together. 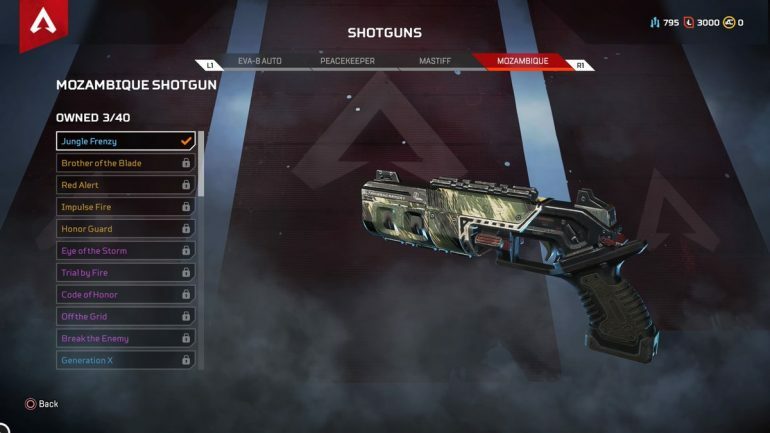 Although this might seem like an interesting concept, the actual result is one of the weakest weapons in Apex. The Mozambique only holds three rounds in its magazine, the smallest amount of the four shotguns in Apex. And statistically, the Mozambique’s damage numbers are laughable. It deals 45 damage to an enemy’s body and 66 to the head if you land all three pellets—which is the lowest damage in both categories for all of the shotguns in Apex. The game might only be a week old, but players have quickly figured out just how ineffective the Mozambique is. In its current state, you basically only want to pick this weapon up if it’s the beginning of the game and you literally have no other option—although some players may argue that even your bare fists are better than the Mozambique. But, in all honesty, the fact that the Mozambique is the laughing stock of Apex isn’t the end of the world—mainly because the other three shotguns are just that good. The Peacekeeper is probably one of the best close-range weapons in Apex right now. If you land all 11 shotgun pellets on an enemy, you can deal 110 damage to the body and 165 damage to the head. The EVA-8, on the other hand, is a fully-automatic shotgun that can quickly deal out lethal damage. And if you’re lucky enough to find a Mastiff in a supply drop, you should definitely pick it up and add it to your inventory. The Mastiff is incredibly powerful, dealing 144 damage to the body and 288 to the head if you land all eight pellets. You’ll have limited ammo for your Mastiff, but if you hit your shots, that shouldn’t matter too much. So sure, the Mozambique is really bad—but it doesn’t really matter when there are other strong shotguns to choose from. If you want to use a shotgun, avoid the Mozambique at all costs and pick up a Peacekeeper, EVA-8, or Mastiff instead.